Forecasting Dust Storms Version 2 provides background and operational information about dust storms. The first part of the module describes dust source regions, the life cycle of a dust storm, and the major types of dust storms, particularly those found in the Middle East. 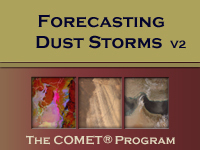 The second part presents a process for forecasting dust storms and applies it to a case in the Middle East. Although the process refers to U.S. Department of Defense models and tools, it can easily be adapted to other forecast requirements and data sources. Note that this module is an updated version of the original one published in 2003. Very helpful lesson in Dust storm forecasting. Overall, a very good lesson. It may get a little repetive and long-winded on certain topics but overall a good course.